More subtle and pervasive is the ‘Sounds of the Serengeti’, by Tim Crowley, which plays African birdcalls, monkey screeches, and occasional grunting over the noise of Falmouth’s main shopping street. The sound is spread across multiple speakers, so it creeps up on the listener’s consciousness (if it is even noticed at all), and the source of the sound is hidden by the narrow street and high shop fronts. There’s an imperceptible mix between the ‘alien’ and the ‘native’ sounds of the gulls and cars, and it becomes particularly hard to distinguish the animal from the human when I walk the street late on Saturday night, the air filled with mating calls and displays of aggression. 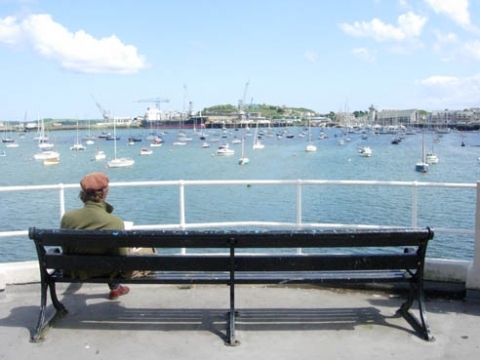 These works in public spaces raise the question of how this festival will situate itself as it develops in future years: will it focus on providing a protective environment which promotes research and risk-taking by artists, or will it aim to have a profile and impact within Falmouth itself? As Dartington College of Art’s merger with University College, Falmouth, nears its 2010 completion, what changes will evolve in the relationship between academic study, institutional reputation, and artistic practice? These questions will hopefully be answered organically, as the festival continues to develop from year to year. The affiliation of such an ambitious, wide-ranging performance festival with an academic institution is an opportunity and strength for both parties, and I hope that institutional support will continue to let the festival discover its own identity as a platform for live art in the South West.